<time> tag is used to define the human readable time and date. <time> tag represents a 24-hour clock time and date. <time> tag is able to encode the date and time in machine readable format. <time> tag supports Global and event attributes. <time> tag belongs to Flow content, phrasing content and palpable content. The HTML4 is does not support tag. The HTML5 is support tag. 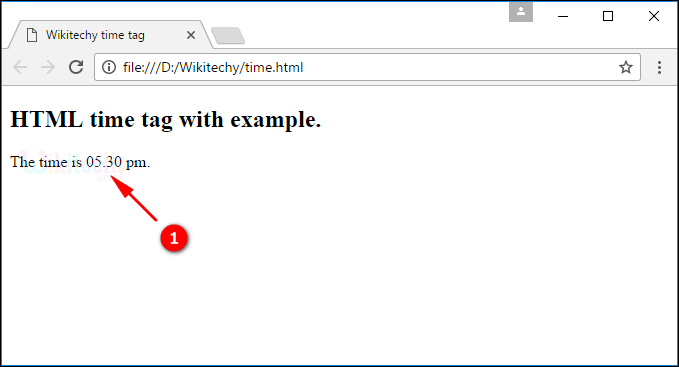 The <time> tag is used to define time in the document. The “datetime” attribute is used to define date time in the machine-readable format. The "05.30 pm” will be visible to human in the browser. datetime datetime No Yes It is indicating a machine-readable time and date of the tag.